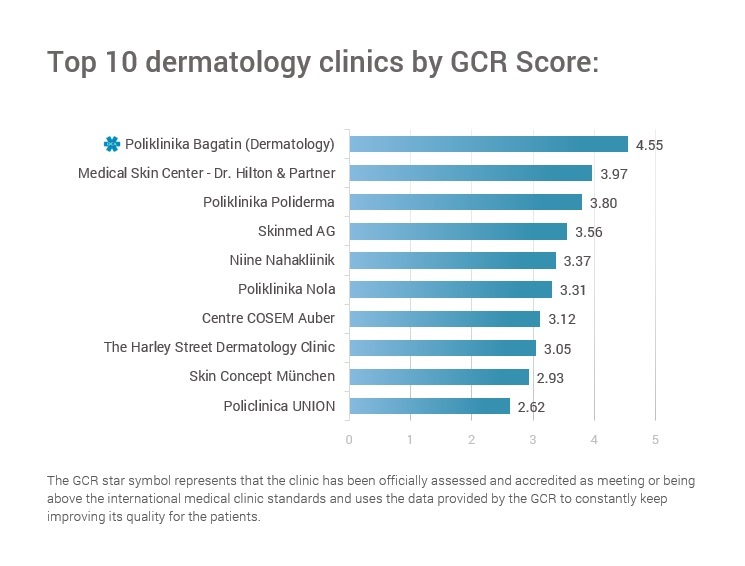 According to the GCR’s latest analysis of dermatology clinics in Europe, Poliklinika Bagatin (Dermatology) ranks as the leading dermatology clinic in Europe, when it comes to overall international clinic reputation. A total of 2 368 dermatology clinics were included in the study. The average GCR dermatology clinic quality score was 3.15. This indicates an increasing healthcare standard across Europe. The GCR – Global Clinic Rating, the leading provider of healthcare clinic ratings worldwide. It aggregated and analyzed dermatology clinics throughout Europe in 2018 including clinics in Germany, UK, Croatia, France, Estonia, Switzerland, Germany, etc. Dermatology clinics were ranked according to their GCR Score. They were compared to other clinics in Europe on the level of apparent expertise, services, facilities and patient feedback collected by the clinic. Moreover, GCR feedback score for the clinics includes patient rating scores from Google & Facebook and other independent rating providers. Poliklinika Bagatin (Dermatology) ranked #1 with a GCR Score of 4.55, and ranks #1 from 2 415 dermatology clinics monitored worldwide, followed by the Medical Skin Center – Dr. Hilton & Partner (3.97) and Poliklinika Poliderma (3.80). Additionally, it is important to mention that all three clinics received score 4.4 – 4.8 out of 5.0 for their Outcomes Score. Furthermore, it’s important to point out that the GCR Scores may change daily, depending on what has been recently changed within clinics’ expertise, facilities, services and patient outcomes. Every little change in clinic’s profile can affect the overall GCR Score of that particular clinic. Download the GCR’s full report Europe: Top 10 Dermatology Clinics in 2018 to discover the names of the other dermatology clinics that made it to the Top 10 Dermatology Clinic list in Europe and to find some brief statistics of these clinics.